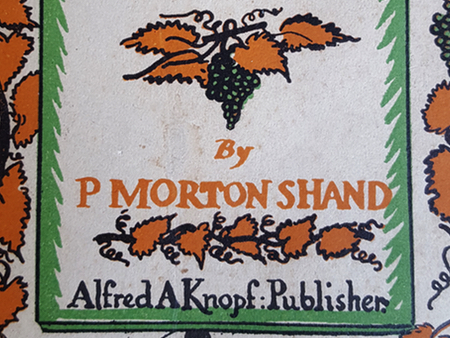 When Lars published his find from the 1929 Encyclopedia Britannica on Moselle Wines, I checked the bibliography of that entry and then learned about the writings of P. Morton Shand (1888–1960). Unlike O.W. Loeb and H.R. Rudd, Shand was not a wine merchant, but a professional writer on food, wine, and architecture—and a very good one. Born into an English upper-middle-class family, he received a traditional education at Eton, then Cambridge, followed by studies at the Sorbonne and Heidelberg. Later, he would say of himself: “I was brought up in no luxurious traditions of fabulously prepared meats. Nor have I much frequented the girdle of magnificent hotels which circle the earth and generalize all the world’s richest dishes and diners into one vast platitude of consumption.” He admired the Germany of the Weimar Republic, but liked best France, where he lived for long periods of his life. He was fluent in both French and German—his excellent command of German was shown already in March 1914 when his translation of Arthur Schnitzler’s play Playing with Love (Liebelei, 1896) was published. During the First World War, he became the superintendent of all German prisoner-of-war camps in Britain. His published writing activity took off seriously a little later, in 1925, when he, at age of 37, published A Book of French Wines, followed by A Book of Food in 1927, and then, A book of Other Wines than French in 1929, which we will deal with below. In the 1930s, he became more active as a critic of architecture; he wrote for the Architectural Review, which at that time underwent a change of attachment from formal classicism to modernism. He was befriended with the director of the Bauhaus, Walter Gropius, and assisted in bringing him out of Germany to England in 1934. At the dinner given to Gropius on his arrival, Gropius paid tribute to Shand. Gropius had brought with him a manuscript that Shand translated quickly into English, The New Architecture and the Bauhaus—one of the most important books on the modern movement in architecture (which is still in print). Besides his journalism, Shand imported design furniture to Britain from Scandinavia. After World War II, he lived in Bath, where he also specialized in old English apple varieties. Later, he settled near Montpellier, France. Shand died during a visit to Lyon, France, in 1960. When it came to wine, Shand was a purist: he praised the German naturreine Weine (“naturally pure wines”), and was not very fond of alterations or imitations; for instance, he called Port a doctored wine, and he disapproved of the attempts from Spain and the New World to copy wine from the Rhine and Mosel. [I]n German vineyards, which are far from extensive, quantity has always been subordinated to quality. The result is that the yield is very small indeed, while growths like Steinberger and Schloss Johannisberger fetch prices more than double those of the finest French wines, white as red, which are in no wise inferior to them. The reason once again is that German wines do not imitate any others and are content to be unique of their kind. Shand treated the wines of Germany more thoroughly in his A book of Other Wines than French, which was published in the spring of 1929. German wines were then still very prestigious in Britain. The chapter on Germany has 30 pages; six out of those are spent on Mosel wines. The wines of the Moselle proper are distinguishable by a fresh and pleasant, but never acid, sharpness of an aigro-dolce nature, which lends to them a refreshing, and at the same time stimulating, quality; combined with a fine, concentrated bouquet which has been described as suggestive of the scent of primroses growing on a bank of damp, mossy earth. Both in bouquet and flavour the Riesling grape in all its native purity and aristocratic individuality is at once apparent. These wines mature very quickly, thanks to their slight body and slender alcoholic content, and do not generally keep well. They should be drunk at latest before their fourth or fifth year as a general rule. Indeed many connoisseurs of Moselle consider that when one of these wines has passed that stage of slight secondary fermentation, or demi-pétillance, recognisable by a faint prickling sensation on the tongue, due to the presence of minute bubbles of carbonic acid gas, it has already survived its prime. The floral, slightly spiced characteristic of the pure Riesling type, both in bouquet and flavour, is developed in them to an even greater degree than in the Moselle proper, though with an even more evocative and evanescent quality of perfume. Their flavour, though quite distinct from either Saar or Moselle, defies any verbal diagnosis of its precise differentiation, save that it has, perhaps, a more pebble, Chablis-like, aftertaste. Both Saar and Ruwer wines are of the highest class, and the best of them enjoy even greater esteem and command slightly higher prices than do the most select qualities of the Moselle growths.